The thermodynamic databases of the U. S. Bureau of Mines and the U. S. Geological Survey are national treasures. Heretofore, they have been available only in print form. Now, both databases have been combined into one, and configured to run inside the powerful Excel spreadsheet program. 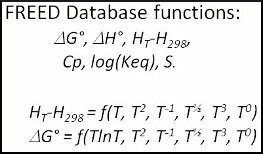 However, just as important, FREED extracts equation parameters from the data to use in making heat balance calculations of interest to materials, ceramic, and chemical engineers, and students in these disciplines. There are 9 options for manipulating the data, making calculations, creating data for new species, and plotting the data. FREED costs $10. The User’s Guide contains many examples that show how FREED is used. FREED has just recently been updated for use with Windows 10 and the latest version of Excel. The help text has been enlarged and the Reaction option page has been edited for better understanding of the graphics. In addition to FREED’s features, all of Excel’s powerful built-in features (such as Goal Seek, Solver, Regression Analysis, and charting tools) can be used on FREED data to make thermodynamic calculations and show results. The data can be formatted in graphic or tabular form, and exported to documents. Advanced users can write macros to manipulate the data in many additional ways, or to export it to their own programs. FREED is free to those who order any Thermart program, otherwise it is $10.